Late to the party as always; I know. All things considered though, I feel this is something worth discussing. 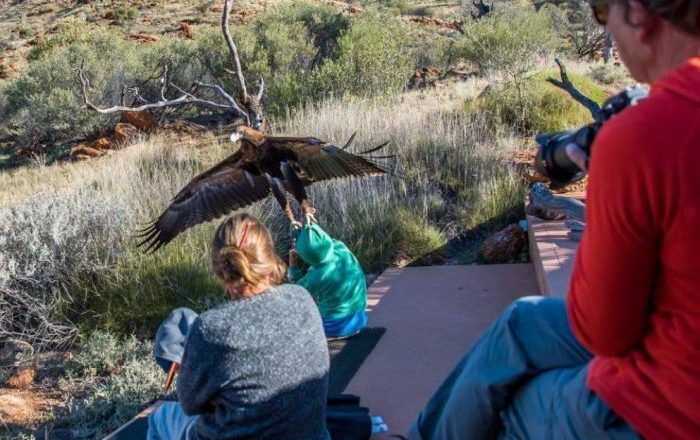 A wedge-tailed eagle attempted to carry away an Aussie lad at Alice Springs Desert Park during the show. The bird failed miserably. The boy is fine. Big deal? Probably not.It’s unusual that a wedge-tail would even attempt this… even with a wing span up to 2.84 metres, the bird just cannot lift the weight of a person (not a baby).I’ll not go explaining the whole story; again, I’m not journalist. You can find more details on the BBC or ABC.There you have it. If you needed any more reasons to stay away from Australia, Australia itself just gave you one. Not sure how far up the list being gouged by Wedge-Tailed Eagles fits; suggestions?Seriously though, don’t let this incident put you off visiting the desert park. Despite the so called attack, I’d still say it’s more than worth taking the time to pay the park a visit. It’s one of my top things to do in Alice Springs for a reason.Heck, I was actually lucky enough to meet a couple of Wedge-Tails during my trip – one of which was injured and stuck in rehabilitation in a cage in the outback. It’s not a pretty sight seeing birds caged up, especially such large, predatory ones that you expect could probably lift a cow if required (they can’t btw).At least being holed up allowed the bird to recover and it was eventually released (Yay!) and then there’s the slight benefit that I got to meet the “little” bugger. Bonus.When you think about it, these Eagles are no more dangerous than meet-and-greeting kangaroos. Joeys not so much, they’re a bit small to inflict any real damage, but those gigantic red backs? Yeah, they’re dangerous, and a lot more angry than most Eagles. They’re also far bigger.Point is, don’t be scared off by this bird going rogue and cutting a boy that likely agitated it (read the story). I’m not saying he or the bird are in the wrong, either. Sometimes we need to accept that wild animals are like.. wild. They don’t play by rules and behave, its natural. Get over it and enjoy meeting them; not every one has that opportunity.Trust me, I know. I was SO happy when I first saw real life pelicans.